The 6-week program will take place on the University of Florida campus, with on-campus room and board. We are very excited about this opportunity and hope that this will be an informative experience for students interested in the Health Science field. Online applications open December 1, 2018 and close February 15, 2019. Applications are available at the national SHPEP website. The SHPEP program dates are May 13 – June 21, 2019. We stress the importance of Interprofessional Training in a unique way specific to the University of Florida SHPEP site. Scholars are given the opportunity to participate in a Disaster Drill/Mass Casualty Simulation with the participation of all six health colleges. 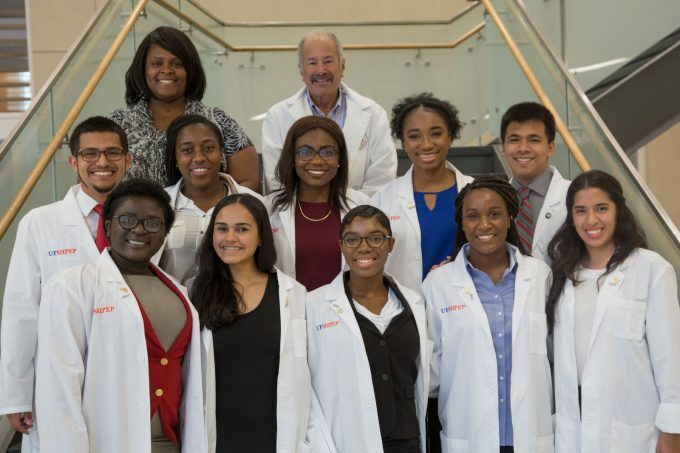 Health Professionals ranging from Emergency Medicine, Pharmacy, county First-responders, and various faculty members and students within these six colleges come together to give our scholars a hands-on learning experience with emergency situations. Sven Normann, Pharm.D., a clinical associate professor of pharmacotherapy and translational research in the UF College of Pharmacy, developed the mass casualty/disaster drill simulation in 2017 and led the exercise. The UF Health Science Center is the country’s only academic health center with six health-related colleges located on a single, contiguous campus. What to expect at SHPEP? If a recommendation cannot be submitted by a pre-health advisor or college professor within your major, the National Program Office will accept one from an employer that is within a health professions field or from a science high school teacher. I’m applying online and I see medicine, pharmacy, dentistry, and public health as my career path choice – I’m interested in another career in health, what do I do? While students select from four main concentrations – Medicine, Dentistry, Pharmacy, and Public Health – selected students will be given the opportunity to learn hands on about veterinary medicine, nursing, physician assistant, and a number of public health professions such as Clinical and Health Psychology, Speech, Language & Hearing Sciences, Health Administration, Occupational Therapy, and Physical Therapy. It is at the student’s discretion which concentration they should choose when they apply. Will meals be provided during my time at UF SHPEP ? Dining debit cards are provided to all scholars to use at University of Florida’s dining locations on campus. All dining locations are open seven days a week. Scholars have a full menu of extracurricular activities to enjoy. Possible adventures include: touring UF Museums, talent show, kayaking, disc golf, volleyball, swimming, tubing, social gatherings with professional students, bowling, movies, and summer concerts on the plaza. Scholars stay in dormitories located in the center of campus free of cost. Dorms are a ten-minute walk from the Health Science Center. Scholars also have free access to the campus and city buses. Will I receive aid with travelling to Gainesville? Is there a cost to attending UFSHPEP? No. Students will be provided with housing,meals, and a stipend that will cover through the 6-weeks. This should be someone who knows your academic and personal character. Ideally this should be a pre-health advisor and/or a college professor. If none of these persons know you well enough, a high school science teacher or a local dentist or physician who knows you well is acceptable. Downloadable flyer! Print to spread the word about SHPEP at UF!